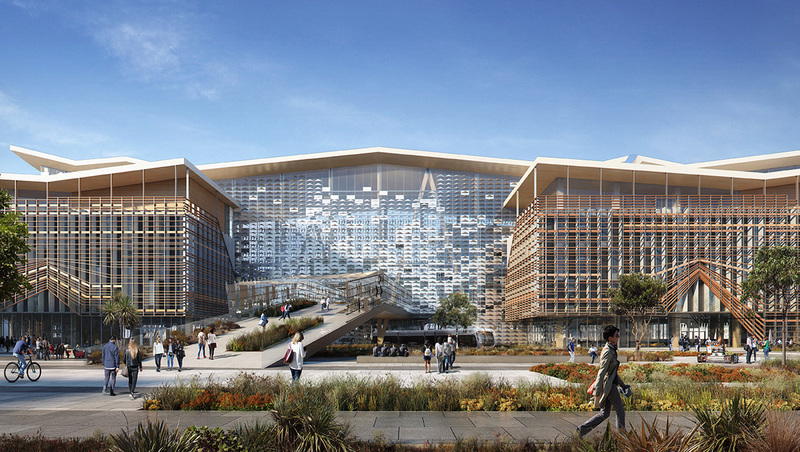 Phoenix–based Studio Ma has unveiled a radically sustainable master plan and conceptual design for Arizona State University’s Interdisciplinary Science & Technology Building—a science and research complex that will be centered around a vast atrium filled with plants and water. 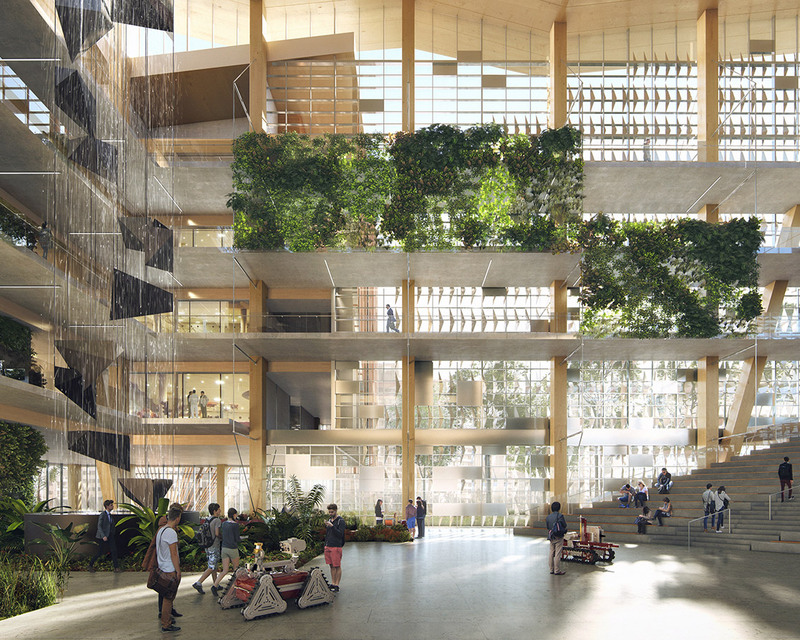 The scheme will literally embody what its professors will be teaching—achieving triple net-zero performance by consuming zero net energy, and producing zero waste and zero net greenhouse gas emissions. “Beyond the field of architecture, we need to be working with scientists,” said Studio Ma principal Christiana Moss. Much of the technology for the building was, in fact, developed by ASU scientists. The green elements inside and out are many. A light-rail station will run right up to the edge of the structure, offsetting carbon usage, while wetlands and bioswales along the periphery will absorb and clean runoff. Not only will the complex’s cross-laminated timber (CLT) frame sequester carbon much more effectively than steel, ASU developed carbon-collection panels that will trap carbon dioxide, which can then be employed to enrich the soil. Sunshades will keep the interiors cool; and rooftop solar photovoltaics will help power the building. Inside the massive day-lit atrium, the biome’s thick diversity of plants will purify waste air, while its wetlands landscape will recycle rainwater, which will be stored in tanks under the biome. An adjacent water-treatment portion of the complex will also treat and recycle sewage (perhaps for the entire campus) for use as gray water using low-energy, bio-based systems. The final phase of that treatment will be moving the water through a hydroponic reactor inside the atrium. 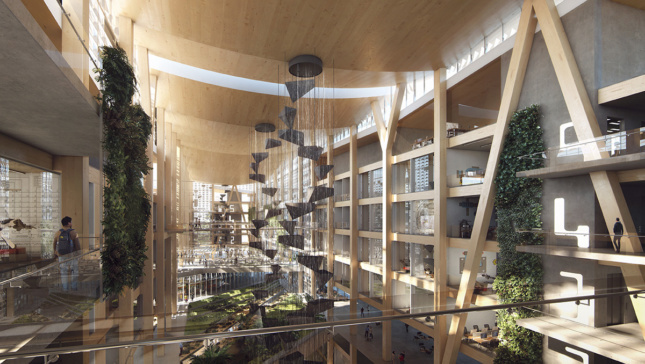 The interior will also be a centerpiece for farming, with grassy areas and even a canal entering the heart of the building. The project’s delivery date is fall 2020. ASU recently issued an RFP, and another architect (still to be selected) will be brought in to oversee the design. But whatever happens, “the function needs to drive the form; and it will require a much broader team of researchers to pull off,” said Moss.